sonic – The Bunch Blog! Recently General Motors has received a lot of love from market research firm JD Power, and that continues today with Chevrolet taking four APEAL awards. According to JD Power research, four GM products in total offer owners the highest gratification of ownership in their segment. Three of the awarded vehicles are Chevrolet products, which is the highest amount of any one brand in the study. Chevrolet received APEAL awards for the Volt, Sonic and Avalanche. This is the third year that the Volt has been the most APEALing product in the compact car segment, while the Sonic and Avalanche have received the award for two years. Ironically, the Avalanche is now out of production and is being discontinued after the 2013 model year. 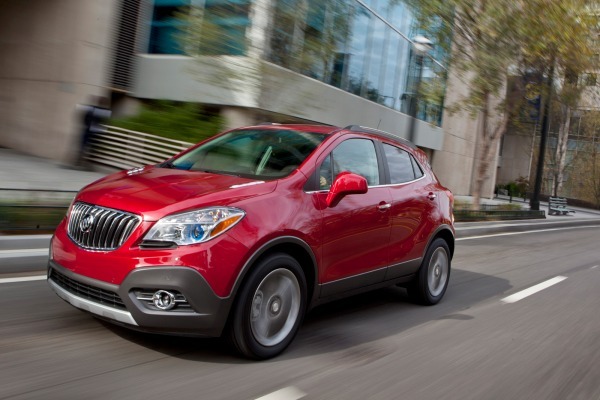 In addition to the three Chevrolet models, the Buick Encore received the APEAL award for the sub-compact crossover segment. The APEAL study is based on over 83,000 responses from consumers that gauge the vehicle’s overall appeal within the first 90 days of ownership. The study sort of goes hand in hand with JD Power’s Initial Quality Survey, of which GM was the top performer on as well. FLINT, Michigan — A lot of cars have been built in Flint but none have been finished quite like this. A handful of comic book artists from the Flint area have started to transform a 2012 Chevrolet Sonic into a work of art and no one, including the creators, is sure what the end product will look like until they finish Thursday. “You want a door? Take a door,” Flint Comix Editor-In-Chief Randy Zimmerman said Monday, just hours after the first group of artists started their shift of work on the Sonic. Wrapped in an extra skin that can handle markers, colored pencil, and paint, the Sonic is on display at the Buick Gallery and the work continues Thursday. Within a few hours Tuesday, a golden-green dragon was taking shape on the roof of the four-door hatchback , Bludgeoner the Bunny Butcher stretched across a front fender in bbasic black and white, and a set of eyes peered out from the signature Chevy bowtie logo on the front of the Sonic. General Motors spokesman Tom Wickham said the idea for teaming up Flint Comix and the Sonic came from a similar event held this fall at New York Comic Con, an annual gathering of some of the most popular comic book artists and their fans. Wickham said the compact Sonic makes an interesting canvas but said the real reason for the event is to bring attention to the new small car and to give comic artists a new audience. Flint Comix artists get exposure now through the monthly comics and entertainment newspaper, which is available free at more than 250 outlets and distribution boxes in the mid-Michigan area. Zimmerman started the publication three years ago, and Publisher Ted Valley said his artists haven’t taken on a project quite like this before but he said he couldn’t resist because both the car and the paper have a shared connection. “Cars and comics: What do they have in common? Flint,” Valley said. Read the full article: here. A kickflip is a word typically associated with the sport of skateboarding, not one that involves cars. But Rob Dyrdek, star of MTV’s reality show “Rob Dyrdek’s Fantasy Factory,” changed all that this weekend at Six Flags Magic Mountain in California. The term kickflip describes a move in which a rider flips his/her board in a 360 degree corkscrew motion while in air. 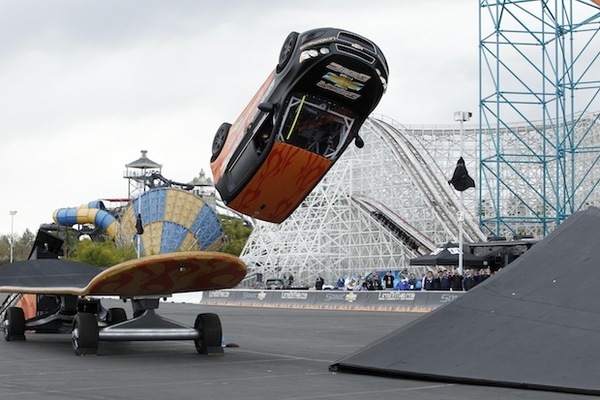 Dyrdek traded in his board for a Chevrolet Sonic as he launched himself off a titled ramp as he soared above an over-sized skateboard to become the first person in history to successfully kickflip a vehicle. A video of the stunt is available here on Chevrolet’s YouTube Channel and will also appear in the season premiere of Dydrek’s reality show (no air date at this time).